The Lenape Regional High School District Board of Education meeting may have been short, but it was important as new and old board members were sworn in. 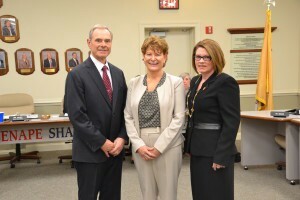 The LRHSD BOE held its annual reorganization on Jan. 4, seeing the induction of new board member Bonnie Olt, representing Evesham Township; the reappointments of Woodland Township representative Margaret M. Estlow and Medford Township representative Dr. William J. Bisignano, Jr.; and the re-election of the BOE president and vice president. Before swearing in the new board members, LRHSD Business Administrator and Board Secretary James Hager read aloud the results of the elections for the LRHSD open seats from November. For Evesham, Olt received 99.32 percent of the votes with 14,441. For Medford, Bisignano received 99.2 percent of the votes with 9,231. For Woodland, Estlow received 98.6 percent of the votes with 432. Tabernacle representative Dr. Robert H. Bende, Jr. was not in attendance, but was also to be reappointed to the board that night. The results for his election were 2,492 votes, or 99.4 percent. The board members sworn in this year will serve three-year terms. Board members gave Olt, as well as the other re-elected board members, their congratulations. Olt said she was very excited to come to the board. Olt had previously been on the Evesham Township School District BOE. She hopes to bring a new set of eyes and ears and different perspective to the board. “As technology is (progressing), I think that the board and superintendent have been doing a phenomenal job. They are way far ahead, and I would like to continue that charge,” Olt said. The BOE meeting also saw the nomination and election of board president Linda Eckenhoff, representing Southampton Township, and vice president Paula Lee, representing Mt. Laurel Township. The LRHSD BOE approved its meeting dates for 2017: Jan. 18, Feb. 15, March 15, April 26, May 10, June 21, July 19, Aug. 23, Sept. 27, Oct. 18, Nov. 15 and Dec. 20 with a reorganization meeting on Jan. 3, 2018.